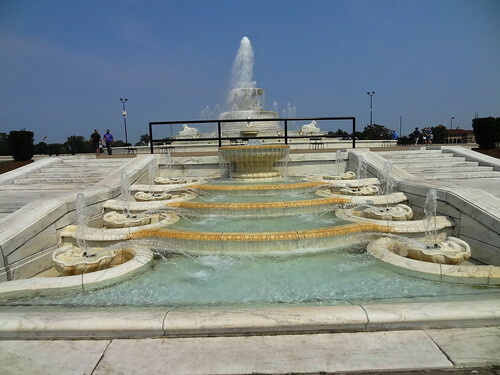 It has been called one of America’s greatest fountains, one look at the James Scott Memorial Fountain, and I’m sure you will agree. 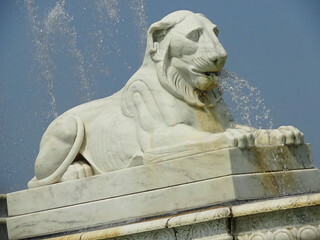 Designed by Cass Gilbert (Detroit Public Library) and completed in 1925 at a cost of $500,000, the construction of the fountain was surrounded by controversy. The story goes like this: Detroiter James Scott was a man of great wealth with a penchant for gambling, womanizing and vindictive behavior, a real scoundrel; let’s just say he wasn’t well-liked. 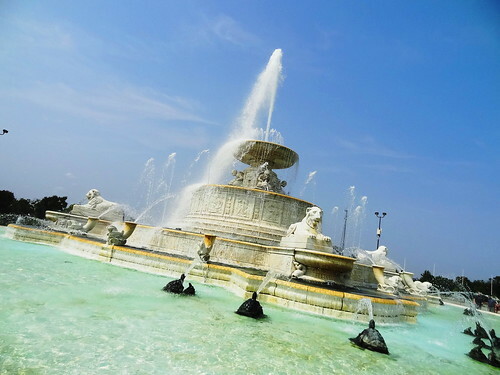 He died in 1910, and bequeathed his estate to the city of Detroit to build a fountain with the condition that it must include a life-size statue of himself, which caused a huge raucous among community and religious leaders who were against honoring such a man. 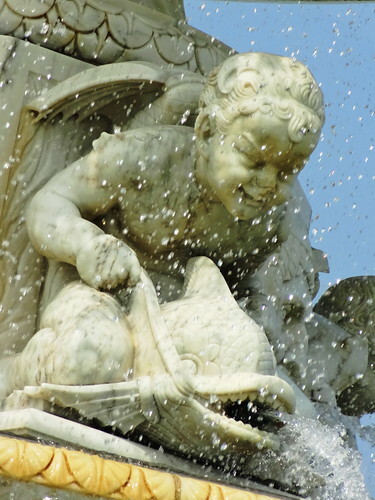 Fifteen years went by; finally, then-mayor Philip Breitmeyer decided it would be wrong to refuse a gift for such a good cause, the fountain was built. 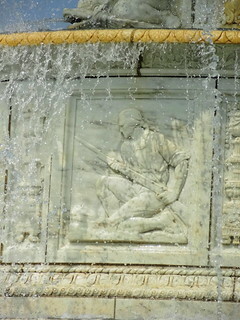 Herbert Adams was the sculptor of the bronze statue of James Scott sitting in a chair, overlooking the glorious fountain he had paid for. 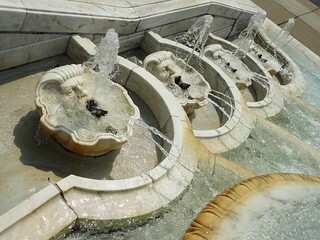 When you visit the fountain, be sure and read the inscription on the back of the chair that ends with, “From the good deed of one comes benefit to many.” Indeed. 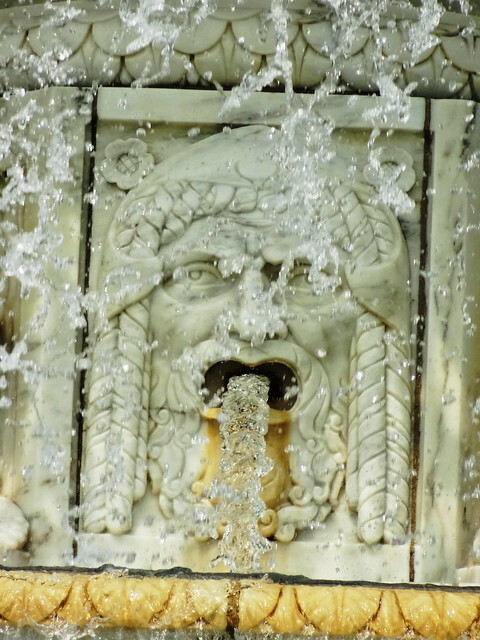 Through the years the fountain has encountered various states of disrepair, copper pipes were stolen, then in 2010 during a repair to the basin, the magnificent original Pewabic tiles were damaged, removed and thrown into a dumpster! 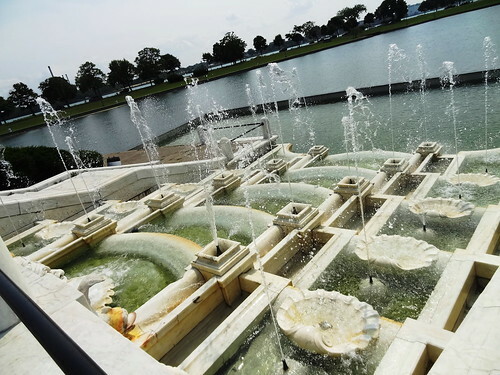 Today we are here in a celebration of sort; all levels of the beautiful fountain are running once again, thanks to unofficial caretaker Robert Carpenter and lots of money from sources such as Roger Penske and the DNR. 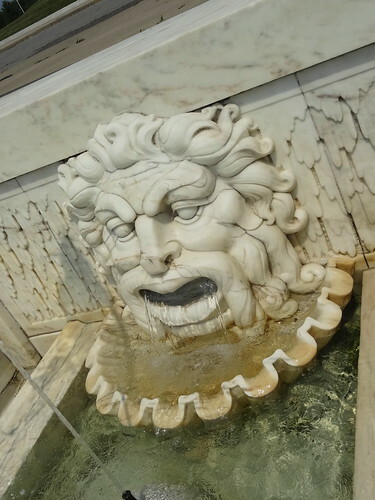 Marble has been cleaned and restored, corroded cast iron pipes have been flushed; water spills from basins, spouts from 109 water outlets, upper and lower cascades flow freely. 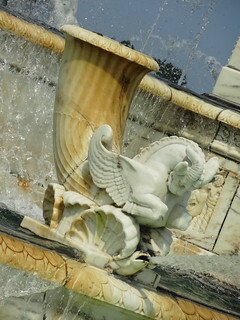 The detail is amazing; dolphins, turtles, frogs and lions join Neptune and cherubs in the splash-filled fun. I can’t even remember how long its been since all five tiers and both cascades have circulated, it’s gorgeous. 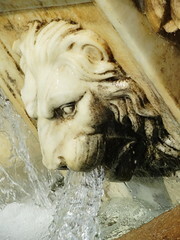 The fountain has long been a gathering place, a constant in family photos from generation to generation, the site of proposals, weddings, a meeting place and one of our biggest tourist attractions. That much hasn’t changed. While walking the circumference of the huge Vermont white marble basin, I overhear a story telling of the days when these folks had come here with their parents, it’s a familiar tale. Even now, after coming here for decades, Kris and I each notice things we haven’t before; I never get tired of looking at it. The past is alive and well. 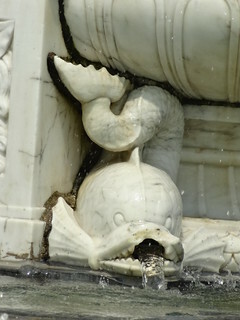 The fountain is located at the western tip of the island and runs from 10 am to 10 pm Memorial Day to Labor Day. We are having lunch at Roses Fine Food; Opened only a month or so now, they serve breakfast and lunch Tuesday – Sunday from 9 am till 2 pm. The tiny, unassuming building with a small parking lot sits on E Jefferson; a tall sign has recently been erected. The main seating area is the counter, which runs the length of the dining room, high stools are mounted to the floor. A hand-written chalkboard lists today’s specials. 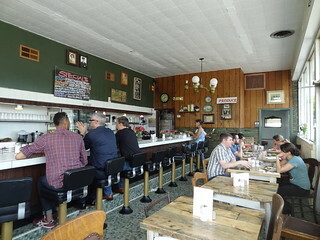 We sit at one of maybe a half-dozen tables resting on the green tiled floor, paper menus and glasses of water are brought right over. The food is of the simple, made-from-scratch variety; pancakes, eggs, sandwiches. It’s near closing time, we are informed there are only three items available, guess that makes deciding easier. Patrons continue to arrive but are told the food is sold out. Our meal arrives quickly; the Egg Sandwich of the Day is a fried egg, topped with 2 strips of bacon and aioli served on a homemade biscuit. 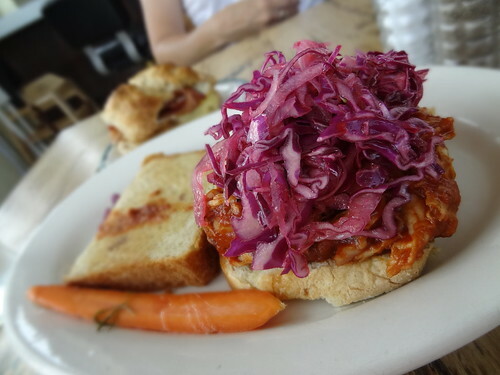 The Cluck is house-smoked, pulled chicken, dressed with Rose’s bbq sauce and picnic slaw served on thick toast with a pickled carrot for garnish. Portions were smallish, but we liked everything we had. 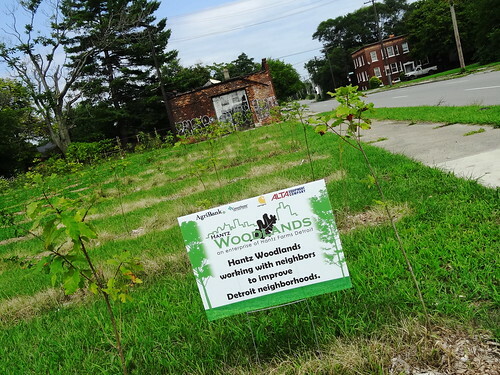 On May 17, over 1,400 volunteers gathered on Detroit’s lower east side to plant more than 15,000 trees on 20 acres of vacant land, in an effort to create the nation’s largest urban tree farm: Hantz Woodlands. 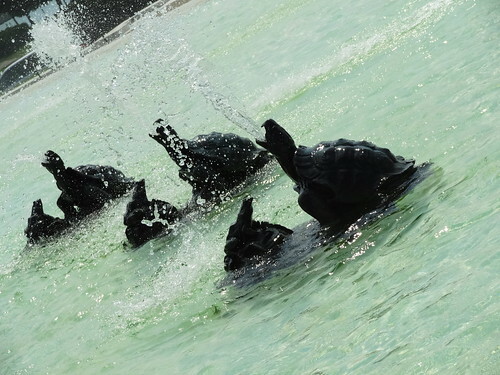 We keep saying we want to go see the area, so today we are. 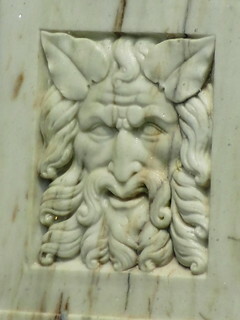 Hantz Farms owns about 150 acres in the square mile bounded by Mack and Jefferson, St Jean and Van Dyke streets. This once densely populated neighborhood had become almost forgotten with its broken sidewalks, abandoned homes and overgrown lots. 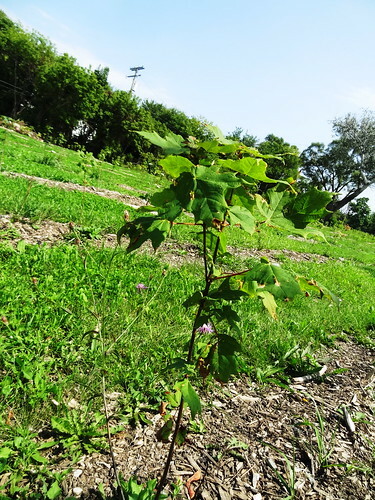 John Hantz came up with a plan to transform the neighborhood, make it safer, more livable with the urban tree farm project. 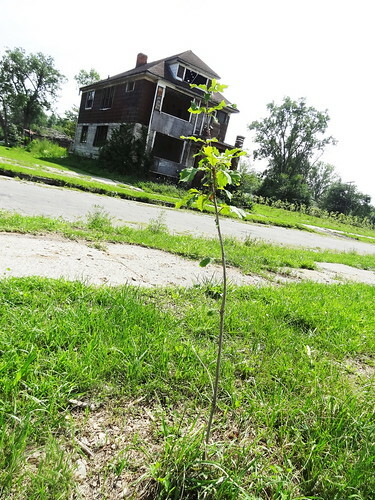 We drive up and down several streets, then, on Pennsylvania, we see rows of saplings soaking up the afternoon sunshine. From there we see lot after lot, some big, some small; tiny hardwoods such as Oaks and Maples stand in straight lines, mulch piled high on the ground. Huge, old trees stand around the outer edge of the lots, they have borne witness to the full cycle of the neighborhood. Looking at all the trees, one can’t help but feel hopeful for the future of the area; blight has been replaced with beauty. Mothers had to walk their children past vacant homes and land that had grown wild, just to get to the school bus, now many of those homes have been demolished, replaced with tree farms where the grass is mowed regularly. It is a source of pride for neighbors. 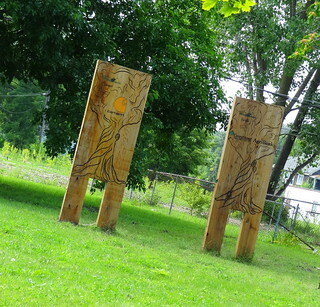 The majority of trees are in the area bounded by Crane, Pennsylvania, Mack and Vernor, not too far from Indian Village. The work continues. 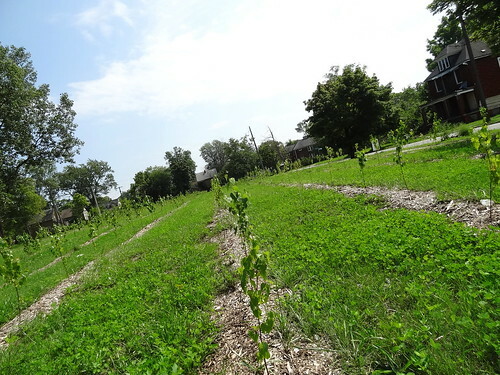 While I was looking at the Hantz Woodlands website I came across something I’d like to share with you: “Before Detroit became an industrial powerhouse, it was part of a great farming region that fed thousands.” In Detroit our past, our present and our future are all connected.